Ratcheting up the pressure on the Obama administration, the House has overwhelmingly approved a resolution that condemns as genocide the atrocities committed by the Islamic State group against Christians and other religious and ethnic minorities in Iraq and Syria. Last week Houston based law firm Andrews Kurths LPP sent a letter to the State Department, Kerry and President Obama laying out the legal case and evidence supporting a genocide declaration. “As many governments, legislative bodies, non-governmental organizations, and world leaders have already concluded, the available evidence demonstrates that ISIS’s actions rise to the level of genocide. Furthermore, we understand that recent information received from on-the-ground interviews in the region and other sources establishes without question that ISIS is committing genocide and makes clear that claims that it is offering jizya or dhimmi status are a publicity stunt or extortion payments that pervert these classical terms,” the letter, submitted on behalf of The Philos Project, The American Mesopotamian Organization, The Assyrian Aid Society of America and The Iraqi Christian Relief Council, states. The State Department is supposed to decide by Thursday whether to agree with the House's genocide declaration on behalf of the Obama administration, but the deadline is likely to be missed as Secretary of State John Kerry punts the issue for political reasons. For months the White House has hesitated to use the term, citing legal definitions and consequences. Experts on Middle East terrorism and genocide pleaded with Kerry last week during a special meeting in Washington DC to make the declaration. Several experts on Middle East terror made direct pleas to U.S. Secretary of State John Kerry to label Christian slaughter in the region as “genocide” Thursday morning during a press conference in Washington, D.C.
“The U.S. is better than this,” said humanitarian and author Johnnie Moore, who published a book last year called Defying ISIS. 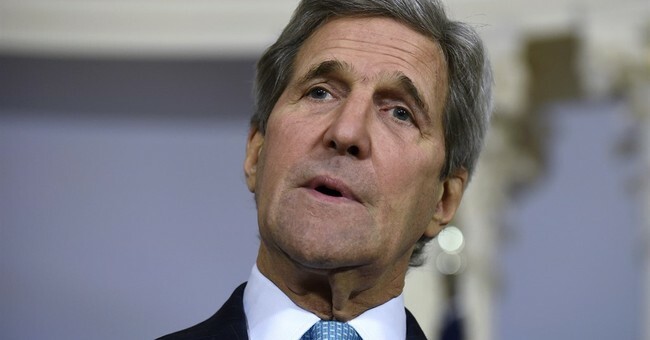 “What will Kerry tell his grandchildren” if we don’t take action against this Christian slaughter? he urged. Moore was just one voice in an important event hosted by the Knights of Columbus to unveil their new in depth report on the rampant murder of religious minorities in the Middle East. The KOC sent its almost 300-page compilation, the largest of any of its kind, to the State Department on Wednesday in hopes of receiving an urgent response from the administration. The Knights’ request for a meeting with Kerry has gone unanswered. Since October, the secretary of state has been claiming the agency simply doesn’t have enough facts to call what's happening to Christians in Iraq, Syria and elsewhere genocide. With the KOC's report, Kerry doesn’t have that excuse anymore.